Two-time defending outdoor 3200m Champion Devin Hart leads returners into spring 2019. And his 2018 two mile time of 8:53.36 is even better than the 8:58.58 Meet of Champions winner 3200m performance listed below. Both those times came within 21 hours of each other in one of the most impressive coast to coast doubles you'll see. This past winter he won the New Balance Nationals Indoor championship in the two mile running 8:56.89. And of course Liam Murphy of Allentown who had one of the biggest upsets of the winter when he won the Meet of Champions in an absolute duel to the line with Devin Hart. Murphy showed big strides in the fall during cross country and has certainly marked himself among the elite with his great 2019 indoor campaign. This outdoor 3200m season is certainly going to be interesting. 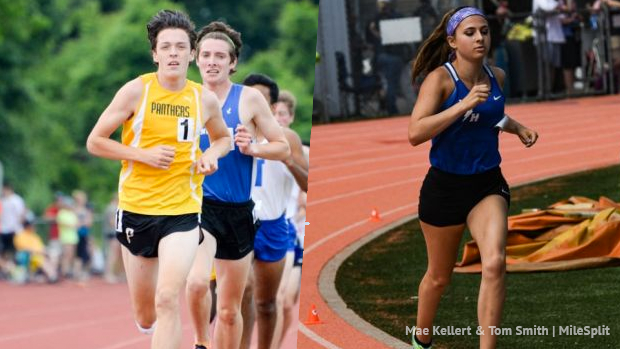 Below you'll see 2018 Spring returners ranked on their outdoor 3200m time, that's followed by their indoor performance this past season as well as their previous outdoor progressions. *The chart below does not include two mile conversions or times. If you would like to see this returner list, with 2 mile conversions, in the traditional rankings format see those rankings here.